Like any other physician or specialist, nephrologists also need to focus on harnessing the power of the internet for the growth of their practice. Online marketing for renal care center helps nephrologists in a collaborative way (unlike traditional marketing) to acquire new patients on a regular basis and retain them as a loyal referral base. With collaborative online marketing support from GMR Web Team, nephrologists can focus entirely on improving their quality of care, while we ensure an unmatched internet presence for them that will help them stand out among the competition and improve their patient acquisition. Our “Nephrology Practice Marketing” strategy is based on three pillars – a satisfied patient base, a stellar online reputation, and a robust online presence. With almost 9 out of 10 patients* (including renal care patients) using search engines to find a treatment center, it’s safe to say the patient experience starts online. Our digital marketing for nephrology practices ensures a brand-wide and authoritative online presence for renal care centers in their target location. A robust online presence also ensures patients have easy access to information about you, can schedule timely appointments, and are able to communicate with healthcare providers and staff seamlessly, all culminating in a higher level of positivity in the patient experience. 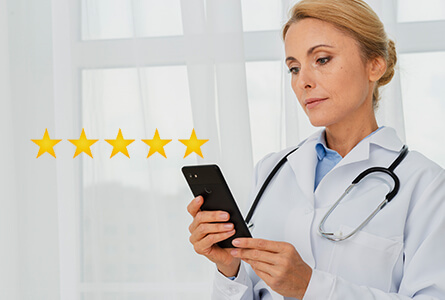 Online reviews are one of the most critical factors that contribute to your patients' decision to choose you over competitors. In fact, 82%* of your prospective patients will use reviews to evaluate your care and patient service. Our renal care online reputation management strategy will help you acquire more positive reviews by facilitating your happy patients to share their experiences about their visit to your practice. Patients likely spend a lot of time on social media on various online forums discussing health conditions and sharing related and useful content with each other. According to PWC, social media can have a direct influence on a patient's decision to seek a second opinion or choose a specific provider. We'll craft a purpose-driven social media & content marketing strategy focused on maximizing your brand's visibility and patient engagement. Included will be highly researched, useful, and unique pieces of content that will create a branded narrative to keep your existing and prospective patients always in the loop. Our concept of online marketing for renal care centers draws inspiration from the needs of patients, and of practices to build and maintain their patient base. 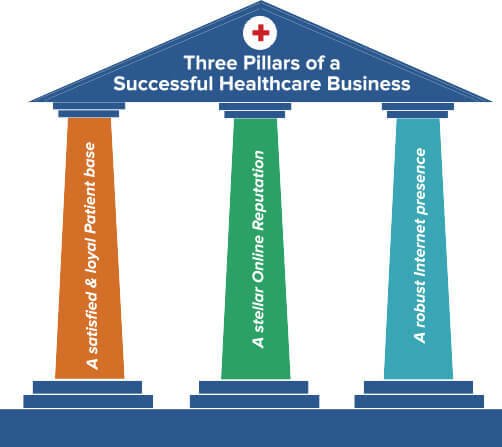 Our focus on the 3 pillars of marketing mentioned above allows us to build unique marketing strategies that will improve patient acquisition and retention for your practice.